Expansion of Jacked Up is coming soon. We discussed ways to raise money to help pay for the construction. 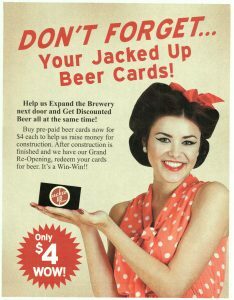 One of the ways is to pre-sell pint cards. They are $4 each and you can buy as many as you want. Keep them for yourself or hand them out as gift cards. They is no expiration date, they are transferable, not refundable. They will be be valid after our Grand Re-opening, not before.